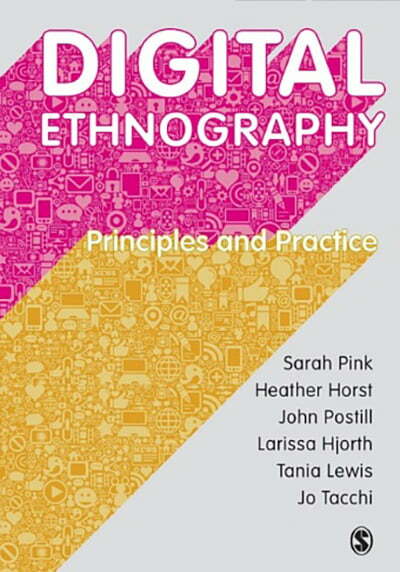 This is a delightful book – lively, engaging, challenging – providing us with the best available resource for exploring the exciting field of digital ethnography. It is an indispensable text for anyone interested in understanding the diversity and complexity of how the digital is woven into everyday life. Sarah Pink is design anthropologist, researcher, consultant and thought leader, whose work focuses on scholarship and intervention in the fields of technology design, digital technologies in everyday life and design for wellbeing. She is currently Professor of Design and Emerging Technologies at Monash University, where she is also Director of the interdisciplinary Emerging Technology Research Lab, spanning Monash Art, Design and Architecture (MADA) and Faculty of Information Technology. Prior to this Sarah was a Distinguished Professor in Design and Media Ethnography at RMIT University and from 2016 -2017 DERC’s Director. Distinguished Professor Larissa Hjorth is an artist and digital ethnographer in the School of Media & Communication, RMIT University. She studies the socio-cultural dimensions of mobile media and play in the Asia-Pacific region. In particular, Hjorth’s work focuses upon intergenerational and cross-cultural approaches. Heather Horst is Professor and Director of Research Partnerships in the College of Design and Social Context at RMIT University, Australia. She was also Founding Director (2012-2015) of the Digital Ethnography Research Centre. Heather’s research focuses upon understanding how digital technologies, mobile phones and other forms of material culture mediate relationships, learning, and mobility. Tania Lewis is the Director of the Digital Ethnography Research Centre and is a Professor in the School of Media and Communication at RMIT University. Her research critically engages with the politics of lifestyle, sustainability and consumption, and with global media and digital cultures. Tania has published over 50 journal articles and chapters and is the author of Smart Living: Lifestyle Media and Popular Expertise (Peter Lang), and co-author of Telemodernities: Television and Transforming Lives in Asia (Duke University Press) and Digital Ethnography: Principles and Practices (Sage). She is also the editor and co-editor of 4 collections with Routledge including Ethical Consumption: A Critical Introduction and Green Asia: Ecocultures, Sustainable Lifestyles and Ethical Consumption. John Postill(PhD, UCL) is Vice-Chancellor’s Senior Research Fellow at RMIT University, Melbourne, and Digital Anthropology Fellow at University College London (UCL). Jo Tacchi is a Professor and Director of Research and Innovation and Deputy to the Executive Director of RMIT Europe in Barcelona. She is trained as a social anthropologist and researches media, communication, development and social change, the senses and emotions, and everyday digital life. She has led a number of multi country projects with partners such as UNESCO, UNICEF, Intel and KPMG, attracting $5m in research funding. She has worked mostly in South Asia.